The first thing to do when you've just bought a tablet for your PC: draw a willy. The second thing to do is post said willy on forums and ask what people think. You will have to be prepared to answer any police inquiries should you post it somewhere inappropriate though. 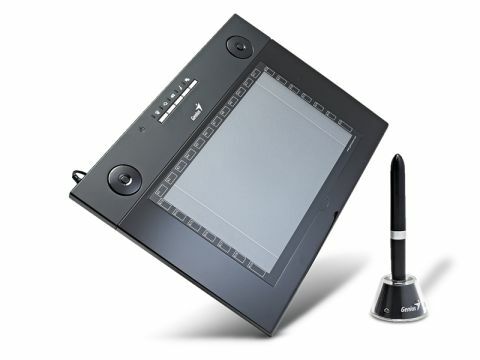 The Genius tablet is perfect for digital phallus representations, as well as a host of other functions and it's also a fair bit cheaper than them posho Wacom tablets. On a more serious note, though, Windows 7 now supports gesture-based control. This means that you can browse the net from the mere flick of your tablet's pen, so if you're even semi-into design related stuff you'll never need to reach for your keyboard and mouse again. Browsing the net using a tablet is fairly tricky to begin with, but once you get the hang of it it quickly becomes second nature. Windows Paint has also been improved to support pressure-sensitive devices, so before you know it you'll be knocking out Da Vinci-style masterpieces, complete with Tom Hanks-befuddling hidden codes. The G-Pen also includes a couple of jog wheels, which can be repurposed to zoom in on web pages or adjust your volume. And, for under £90 it's surprisingly solid and well made; making it probably the most recommended of these devices if you're starting out as an amateur artist. Even our (professional) art bods like it. For drawing willies.